In India, where marriage is a must but AIDS is unspeakable, how do you find love if you're HIV+? One doctor finds a way – by playing matchmaker for her patients. 10/20 @ san josé state Univ (presented by India Currents). tickets here. 10/24 @UNAFF, san francisco. Tickets here. Across the world, over 36 million people live with HIV, many in places where HIV/AIDS is unspeakable. So, how do you find love & marriage when you are HIV+? In 1986, Dr. Suniti Solomon discovered India’s first case of HIV. But without medicines, she could only console patients who “other doctors weren’t even willing to touch.” She quit her prestigious academic post in microbiology and founded YRG CARE, today India’s premier HIV/AIDS clinic. Fast forward 25 years: India now produces its own generic anti-retroviral medications, enabling Dr. Solomon’s to patients live longer – and face the pressure to marry. At 72, and in the twilight of her career, Dr. Solomon has taken on a new role: marriage matchmaker. LOVESICK interweaves Dr. Solomon’s unconventional personal and professional journeys with the lives of two patients: Karthik, a reticent bachelor, and Manu, a bubbly IT professional who, like many women in India, was infected by her first husband. As Karthik and Manu search for love, they learn how to survive under the shadow of HIV. Like other Indian matchmakers, Dr. Solomon matches by the religion, education, and income; but she also matches by white blood cell counts (CD4) and viral loads. For her, this isn’t just about romance – it is a way to stem the spread of HIV and fight stigma. Eight years in the making, LOVESICK is a surprising portrait of modern love in the age of AIDS. Dr. Suniti Solomon, a pioneering female scientist and founder of YRG Care, India's foremost HIV/AIDS clinic. 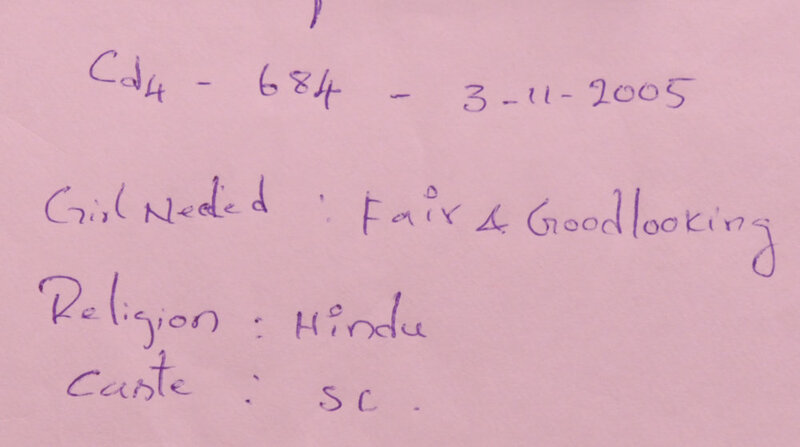 Similar to regular Indian matchmakers, Dr. Solomon and her team collect "bio-datas" of singles looking for love. 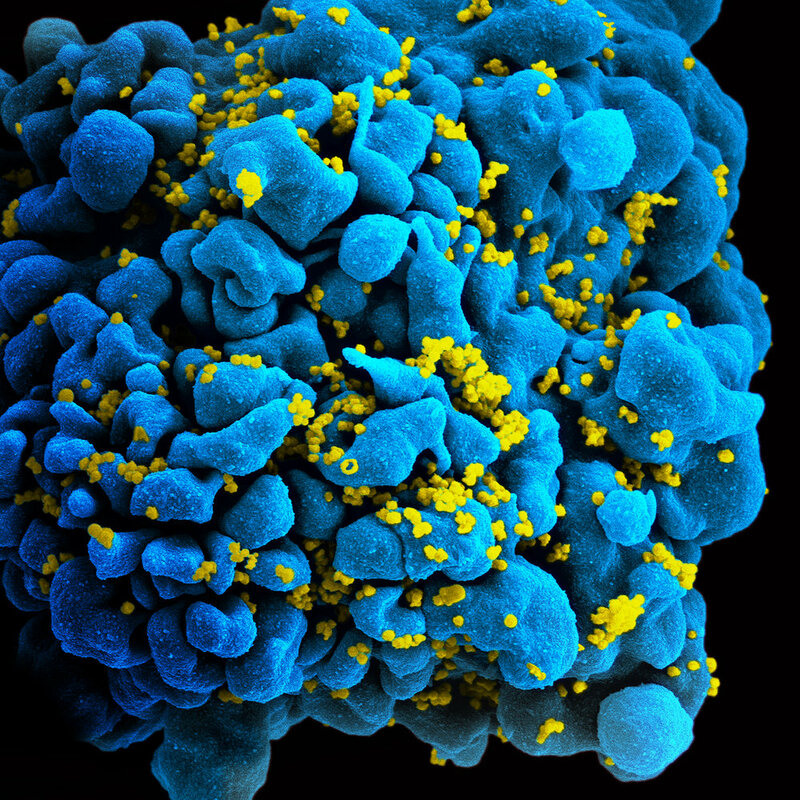 A CD4 cell infected with HIV virus. Looks are always important. "No one wants a dark girl, but I think dark girls look beautiful," says Dr. Solomon. Living with HIV for over 16 years, Karthik is still unsure if he will ever find someone to marry. 1n 1986, Dr. Solomon discovers India's first case of HIV in Chennai, India, which would later prove to be one of the hardest hit areas of the epidemic. Ann S. Kim is an independent filmmaker who has reported on a range of science global health issues for public television and radio. Her credits include The Age of AIDS (FRONTLINE/PBS) and Unnatural Causes: Is Inequality Making Us Sick?, both duPont-Columbia Award winners, broadcast journalism’s highest honor. Outside of film, Ann is a Director at global design firm IDEO. From 2016-2017, Ann served as the first Chief Design Officer for the U.S. Surgeon General, bringing design thinking into government and urgent public health issues of addiction, opioids, and social isolation. Ann is a graduate of Harvard College, with a joint degree in Anthropology & the Study of Religion. She is a fellow of the US-Japan Leadership Program, Women at Sundance Fellowship, and term member at the Council on Foreign Relations. Ann is a founding board member of the Karen Schmeer Film Editing Fellowship. Priya Giri Desai’s work in print and broadcast media spans two decades and includes work for outlets such as LIFE magazine as well as PBS and independent film projects including the health disparities series Unnatural Causes (PBS), Enlighten Up! (theatrical) and Forgotten Ellis Island (PBS), a film about public health and immigration in America. She earned an Emmy nomination for her work as producer and writer on the children’s series Postcards From Buster (PBSKids) where her love of reporting on cultures and communities came together as she conceptualized and produced several shows about the lives of children around the world. 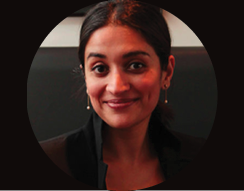 Priya is a graduate of Duke University with a degree in Comparative Area Studies focusing on South Asia. She is a founding board member of The India Center Foundation, a cultural non-profit organization in New York dedicated to the study of the Indian subcontinent, the promotion of its cultural life, and the unique relationship between India and the United States. Sign up to receive news and updates about LOVESICK. We respect your privacy & will never share your email. Thank you for staying connected, as we launch LOVESICK.